PEACEFUL AND TRANQUIL LOCATION!! A WARM WELCOMING HOME AWAITS THE RIGHT FAMILY. YES INDEED!!! Contemporary in design, this well maintained split-leveled single-family home is set on over half an acre of mostly flat land in close proximity to the St. Lucia Golf and Country Club in Cap Estate…one of St. Lucia’s premier residential developments. Property enjoys a lovely cooling Atlantic breeze. 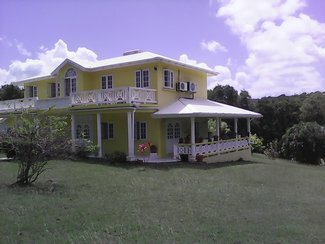 The property is fully enclosed and offers a well-manicured garden with a variety of beautiful flowers and mature fruit trees namely; mangoes, guava, papaya, lime, avocado, pineapple, coconuts etc. The features in this comfortable home includes a wrap-around porch, a spacious master bedroom, a large lounge, spacious kitchen/dining, air condition in all bedrooms as well as high ceilings, a study/office, powder room, laundry/storage and car port. No additional photos available for this property.